Coloured caricature print, published by Reeve of Oxford Street, 8th October 1804. 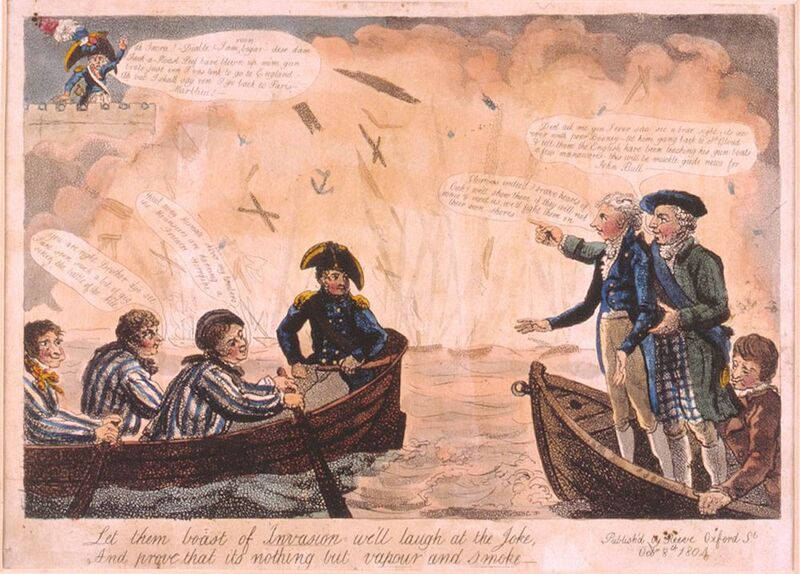 This print comments on the attack on Napoleon's invasion flotilla at Boulogne, 3rd October 1804. The design shows two British boats at sea, one containing William Pitt and Lord Melville, with a huge explosion in the background and a frustrated Napoleon on the fortifications. This attack used a new method to attack ships at anchor. Ships were packed with explosives and towed amongst the French ships. The eventual explosions made a great noise, but caused little damage. Lord Melville, First Lord of the Admiralty, was onboard a ship in the squadron. He was Scottish so inevitably is shown in tartan. Despite the fact that William Pitt, the Prime Minister, actually watched the raid from the shore, the artist has chosen to show them together. This Let Them Boast of Invasion We'll Laugh at the Joke, And Prove that its Nothing but Vapour and Smoke Art Print is created using state of the art, industry leading Digital printers. The result - a stunning reproduction at an affordable price.